» Listings » Clubs & Classes » Got a Club or Class – Get Listed Today! Got a Club or Class – Get Listed Today! Have you got a club or a class? Do you want to get the word out and let people know you exist? Balbriggan.info invites you to list your club or class for unparalleled coverage in Balbriggan and surrounds. You get a full webpage that you can edit as often as you like giving you full control to update your information from the comfort of your own computer…. 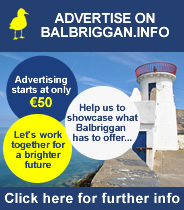 Let’s work together to showcase the best that Balbriggan has to offer….